Here we have the Sixth Doctor, a companion from the 1940s, and a story that sounds like it has been designed for modern TV Who fans who are just discovering the delights of Big Finish. There’s lots of running, lots of energy, easy cookie-cutter characters to interact with, and a sound design that comes straight from the TV show. It’s meant to sound fresh, but to these jaded old ears the story doesn’t hit all the bases. In some respects it’s typical middle-story-in-the-trilogy material, setting up the next tale in the range. It does that very well, with a well-executed final scene, Constance’s motivations being entirely believable. But everything else in the plot is throwaway – the Genocide Squad, the aliens, the slightly hokey power-crazed billionaire. The telepathic link between the Doctor and Constance via the Tardis is a bit too convenient for my liking. There’s a lot of “telling”, which there has to be since this is audio, but this is telling in place of character. And with that, I’m done. 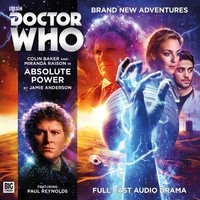 I’m finding it difficult to say very much more about Absolute Power – seriously, it just isn’t a story that appeals to me. It could be worse, but it could have been a heck of a lot better.